You may not have pre-ordered Forza Horizon, but you can now drive vehicles that make it look like you did. When Forza Horizon was released on October 23, 2012 it was promoted alongside a slew of typical game hawking techniques. Most notably, a pack of five cars ostensibly exclusive to those willing to drop money on the game before it was ever available on shelves. However, as with all claims of exclusivity in the gaming industry, the idea that only pre-order buyers would ever use these cars was simply wrong. As of now any of you with a copy of Forza Horizon and $5 worth of Microsoft fun bucks can download the Pre-Order Car Pack DLC from the Xbox Live Marketplace. But then, who cares, right? If you're a Forza fan your only concern is for which vehicles can be found in the pack. In that regard, your $5 is going toward some gorgeous machines. 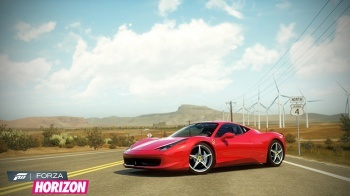 Included in the pack are a 2010 Ferrari 458 Italia, a 2011 Mercedes-Benz SLS AMG, a 2012 Aston Martin Virage, a 2010 Nissan 370Z and a 2010 Volkswagen Golf R. The Forza Motorsport blog has surprisingly detailed descriptions of each vehicle that are worth a read for virtual car geeks. We won't reprint them here to save the rest of you from a text wall, but have a look at the official blurb covering the Ferrari 458 for a hint of how developer Turn 10 Studios describes these cars. A successor to the Ferrari 430 had to capture and improve upon all the elements of its predecessor. While completely new-- from its direct injected 562 horsepower 4.5 liter V8 to a litany of electronic aids--the 2010 458 Italia does just that. F1 champ Michael Schumacher participated in its development and, with a claimed top speed to 202 miles per hour, it's nearly competitive at Grand Prix level. The Ferrari's exhaust note is delivered through three exhaust tips, which range from low-end grunt to a high-RPM wail. That huge power band is transferred to the wheels via a seven-speed, dual-clutch transmission making the 458 a smooth customer in the acceleration department, capable of hitting 60 mph in just 3.4 seconds. Bringing the 458 back to 0 from 60 in just 107 feet is a high-tech ABS system applied through carbon-ceramic discs. This car screams for the open road and its sleek eye-catching form has the beauty and grace you would expect from Ferrari. Detailed, no? Each of the descriptions are like that, so while you're stuck at work, unable to play videogames, you may as well entertain yourself by reading up on the cars you can download once 5PM rolls around. It's not like your boss expects much of you anyway, is it?